Zinc Polycarboxylate cement was the First cement that was developed with the property of an adhesive bond to tooth structure along with some metallic cast restorations. Stannous oxide – Modifies the setitng time, increases the STRENGTH and acts as Anticariogenic agent. Unsaturated Carboxylic Acid Ex: Itaconic acid, Maleic Acid, Tricarboxylic acid. The Setting reaction of Zinc Polycarboxylate cements involves the reaction between the outer portion of the powder particles and the ionized Copolymer of Acrylic acid and Itaconic acid. Powder and Liquid are mixed. The Acid attacks the powder and causes a release of Zinc, magnesium and tim ions. These ions react with carboxy groups of adjacent polyacid chains so that a cross linked salt is formed as the cement sets in the same way as occurs for the glass ionomer cements. The result of the reaction is a cored structure in which the unreacted powder particles are bound by a matrix of zinc polyacrylate. The setting reaction is very fast which must be retarded to allow for a resonable working time. The manufacturer – depending upon the method of manufacture of the powder and liquid the setting time can be altered which is in the hands of the manufacturer. Use a Cold Glass Slab: Cold Glass slab retards the setting reaction and prolongs the setting time of Zinc Poly Carboxylate Cement. But this also causes the polyacrylic acid to thicken in consistency. This increases the viscosity making the mixing procedure more difficult. So make sure that you refrigerate only the powder before mixing. The powder should be incorporated into the liquid in one large increment because the reaction is not delayed by incremental mixing. Adding water and increasing the temperature of the mixing environment accelerates the setting time. Bond strength is greater to the enamel than dentin because polyacrylic acid reacts with Calcium ions, enamel, dentin via carboxyl group. Zinc Polycarboxylate fuses to tooth structure and metal and hence it can be used in fusing indirect metal restorations to tooth structure like – Metal Crowns and Metal Ceramic Crowns. It is not useful in fusing Zirconia or All ceeramic crowns. pH of Liquid in Zinc Polycarboxylate: 1.7 which is readily neutralized by the addition of powder which makes the pH higher than Zinc Phosphate cement. 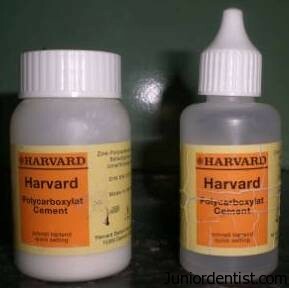 In-spite of the initial low pH of Zinc Polycarboxylate cement it is not an irritant to the Pulp. Which can be attributed to the large size of the Polyacrylic acid molecules which limit the diffusion through dentinal tubules. It is highly bio compatible to the Pulp which is similar to ZOE cements. It is Anticariogenic, Fluoride release from this cement is only 15 – 20% of the amount released from glass ionomer cement. Film Thickness: 21 micrometers. It is pseudoplastic and more viscous than Zinc phosphate cement. Solubility: 0.6% solubility of the cement in water is low ut more in acids. It is comparable to that of zinc phosphate cement. Viscosity is slightly higher than Zinc Phosphate cement. The mixed cement appears thick but flows readily when applied to the tooth surface. Thermal insulation: Good. In thickness of 1.5mm. At less than 1.5 mm thickness it is not an effective thermal insulator when compared to the other cements. Opaque nature: It is Opaque because of the large quantity of un reacted zinc oxide. Dispense one drop of liquid and powder on a mixing pad. Powder/liquid ratio is 1.5 parts of powder to 1 part of liquid by weight. Incorporate half of the powder in the liquid in patting and folding motions using a small area of the pad surface. 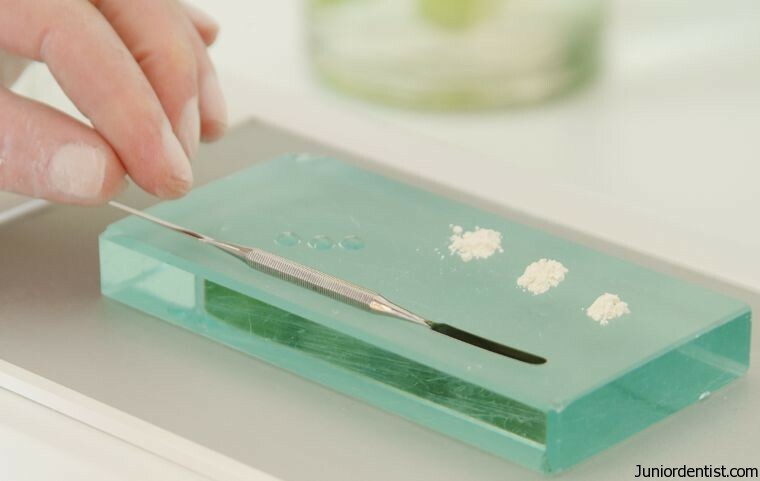 Add small increments of powder to the mix, using the same mixing motions until acquiring the proper consistency. Cement should be used mmediately because the working time is short. polycarboxylate cement will adhere to instruments particularly those made of stainless steel. Thus it is useful to use alcohol i.e spirit or dry powder as a release agent for the mixing spatula. Instruments should be cleaned before the cement sets on them. You didnt give me enough information,next time improve thank you. What do you want to be explained? what is zinc polycarboxylate used for? Are you in position to supply Water active sodium polycarboxilate? Thank You Dr. Varun for this information about zinc poly carboxylate cement. can i use the liquid of zinc phosphate cement for etching of enamel and dentin? When you look at the composition, as both contain Phosphoric acid you might think it can be used but it cannot be. There is a slight difference in the percentage of Phosphoric Acid concentration and also in Zinc Phosphate cement the liquid contains Water and Aluminum phosphate which act as dilutants along wit Zinc and Aluminum which make it not usable as an etchant. Normal Acid Etchant is pure 37% Phosphoric Acid which acts on the Enamel directly whereas the Zinc Phosphate liquid is diluted. •	sedative to a hyperemic pulp. What are contraindications of zinc polycarboxylate cement and why. Zinc polycarboxylate cannot be used in bonding Gold, porcelain crown or Zirconia crowns as it does not adhere to these surfaces. As compared to GIC there is less fluoride release from Zn polycarboxylate. Do u have simplified ver of glass ionomer cement and resin modified glass ionomer cement such as this post? Will write it in a couple of days. It would’ve been a more complete post if you included what it can and cannot be used for. Otherwise great post!